If you remember in my dining room post, I mentioned we moved the old antique table into the kitchen. It was way too small for our dining room, but luckily it fits perfectly in the eat in kitchen. When my husband and I aren't eating in front of the TV, we eat dinner here. I think this table is my favorite thing in the entire house. It's from the 1800s and I love to think about the families a long, long time ago eating around it. I want my house to be haunted by those ghost chairs. Good find! I LOVE that table - so beautiful!! What a great table! Looking forward to see what color you pick for the floor. I'm awarding you the "Stylish Blogger Award" for your inspiring and lovely blog! This award is passed on from blogger to blogger. I received the award from someone, and I'm passing the award to you. Part of this award is to write seven things about yourself (in your blog post) and pass this award to 15 other recently discovered blogs you think deserve this award too. Where did you get the ghost chairs? That table IS beautiful. I like the contrast between the antique and the contemporary chairs. I personally wouldn't worry about the vinyl floors, they look very clean and seem to blend (at least from the picture they do!) and they could be much worse! And this is coming from someone who also loathes her own vinyl floors with a passion. We are saving up to have ceramic tile installed (I adore hardwood too but our current layout wouldn't look good with that in the kitchen) and until then I am just trying to ignore the vinyl and play up the other features of the room. This will be interesting. I've never heard of anyone painting a vinyl floor. I'm with Sonya. Your floors are very neutral. I say live with them until you can replace them. I am sure I am not saying anything that you have not thought of Bryn..But maybe a seagrass rug under the table would help you not to focus on the vinyl.......although I say go for the paint too!!! When we cook dinner every night my husband always asks "traditional?" which means we are eating at the table or "non-traditional?" which means we are eating on the couch, over the ottoman. I cannot remember who started that, but it make us laugh. We think we're funny. Hi Bryn, I read daily but haven't left a comment before...love love your blog! I have the luxury of time today being snowed in here in NC. I would find an indoor/outdoor rug for this space, they are impervious to damage of any kind, take it from this mom of two boys and three cats. They are available in so many georgeous, modern patterns and colors. But you know all of this already, of course! You guys have definitely read my mind... I have been thinking about a 5 x 7 jute rug to go under the table also. In fact I think Lowe's had one recently for only $40! I wonder if they still have it.. I am sort of kicking myself for not getting it! Love the history of the table and I say go for the floors! LOVE the table! Go for it and paint the flloor - would love to see what you come up with! 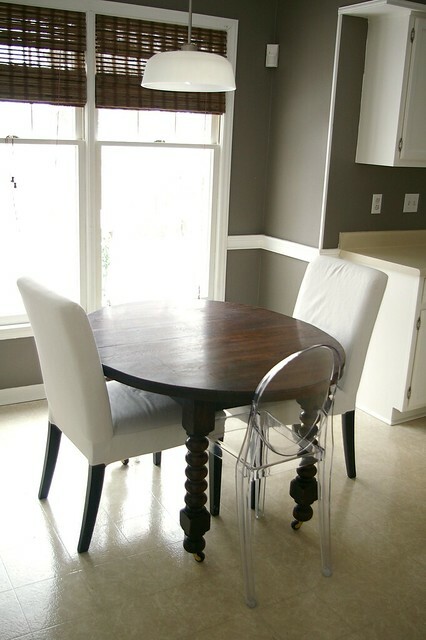 LOVE the combo of the antique table with the modern ghost chairs!! I painted/stained my hideous vinyl floor (10x more hideous than yours). We are going to do a kitchen remodel, so I knew it was just temporary. We have a small house so what bugged me the most was how it would catch my eye because the color between the wood floor and light vinyl floor was so different (plus it showed every crumb and stain). So I TSP'ed the floor, primed it (Ii should have tinted the primer a tan/light brown color but I didn't have time because I had to get this all done while my husband was at work - that's when I do all my crazy projects that I'm not sure hubby will be 100% cool with!!). Then I got my wood graining tool and went over the floor with wood stain using the wood grainer. It wasn't perfect and I didn't make it too grainy, I just wanted a slight effect. Then I after that coat dried I put a quick coat of stain on top of that, then two coats of polyurethane with one of those long handled mop type tools. Sounds like a lot but it wasn't really, and my goal was to make the floor pretty much disappear and blend with the wood floor. And it worked! The coat of poly on top is key, so even if you just end up painting, the poly makes it extremely durable and easy to clean. I can see wide stripes in a lighter color than your walls and an off-white color looking good, maybe two squares wide? My advice, even if you get a rug, is to do something with paint or stain. I know that NOTHING goes with those floors, and you can do something fun and make it your own knowing that it's only temporary. 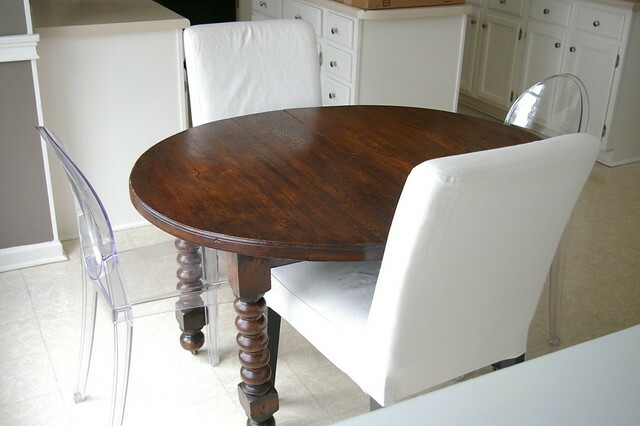 We also have a small antique table in our kitchen/dining room (we only have one) - and it's my favorite piece too! It's actually the table I grew up eating at, and I got it from my parents after college. Love the legs on yours! Very unusual! 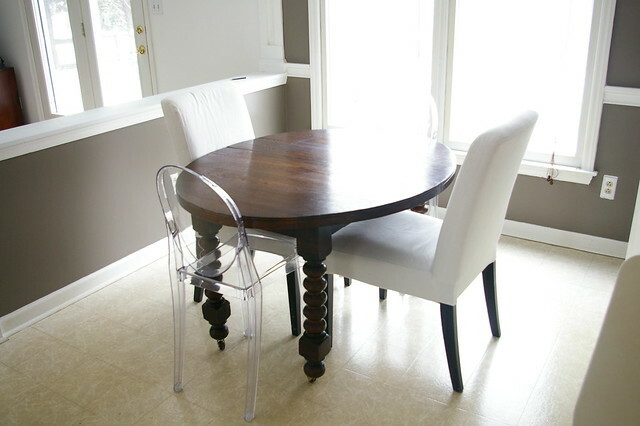 I love the ghost chairs, I just did a post on them a couple days ago. I would go for the jute rug...the floors are so neutral they don't pull your eye! The fabulous table does! well done! Confession time: My husband and I eat in front of the TV almost every night. I do love TV! You always do such an amazing job with your furniture. I'm glad to see you coming back every week. Well, Such a wonderful collection and plan to buy one of my new home. Your collection is very new and best for modern homes. It seems vintage looks.